I have: a solid practical experience of developing, marketing, streamlining and leading companies and people. Some of my strengths are my curiosity and openness, my hunger for challenges, a great social knowledge and good mood. I’m familiar with tech and support as well as administration and marketing. I know: staffing (recruitment, education, development), technical development (specification, documentation, implementation, a bridge between tech and market), marketing (social meda, search engines/SEO, blogs, PR, guerilla marketing, press contact), administration (company management, trend and market analysis, competitor monitoring), support (structure, documentation, internal/external, verbal/written, streamlining, automation) and text management (copywriting, translation, writing for the web). I’ve worked professionally with WordPress since 2005. I’m a contributor to the Swedish WordPress community and translation team. 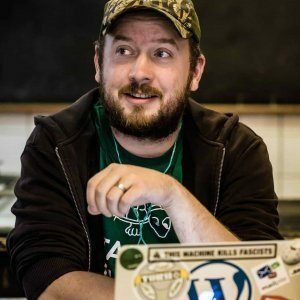 I’ve arranged WordPress meetups, been a speaker at multiple WordCamps and written 100’s of (appreciated and linked) WordPress user guides. I don’t just talk WordPress, I also use it extensively myself. I was the webmaster of Svenska Saabklubben for 4 years and built one of the largest WordPress Multisite networks in Sweden (18K+ users, 200K+ posts) for them. My primary focus, when it comes to WordPress, is operations/administration, security and optimization. But I’m actually skilled in most things WordPress. I’ve worked in the hosting and domain name business for almost 17 years now. I’ve been involved in, and built, some of the largest web hosting and domain name companies in Sweden. And I still love working with hosting. Web hosting today is nothing like web hosting back when I started working with it. This is an incredibly fast growing industry, where it’s extremely important to stay up to date with all the exciting new technology. I’m an admin/operations guy at heart, so I know my way around servers, but I’ve been heavily involved in marketing, TLD management, customer service and much more. In the end, it’s all about providing a better customer experience. After 9 months of parental leave and some consulting, I assumed the position of Marketing Manager for the web hosting provider FS Data. Besides marketing, I’ve been involved in business and service development. I was contacted by Mathias and Johan, who wanted to stop paper based advertising and offer (voluntary) digital advertising. It was an exciting challenge, with a strong environmental focus, which I accepted by my heart. The idea was developed to an actual smart solution. I came up with the name (“reklamfritt” is Swedish for advertising-free), the concept, did research, developed the message, planning, marketing, wrote a blog (120+ posts) and more. Of course, much work was made in cooperation with my colleagues, but I was the primary driving force of Reklamfritt.se. This was a project work, of 80 %, for one (1) year. In a year we stopped 100’s of tons of paper ads, we got more than 7 000 members (20K+ now) and 40 000+ fans on Facebook (150 000 fans at its peak, being the second largest FB page in Sweden). After having been in contact with multiple web hosting companies in Sweden, I chose to enter as partner and employee at Aleborg Solutions AB (which changed name to Binero AB in 2007). I was primarily responsible for marketing and domain name management. When I came to Binero, it was a small and anonymous company, primarily focused on tech and support. My contribution was to open up the company, to market it effectively and to enhance the customer dialogue. I also started a media debate about web hosting terms, which forced large companies such as Loopia and Crystone to update (and ease up on) their terms. Today, Binero is one of Swedens largest and well know web hosting companies. It was prised as “the best Swedish hosting company” by multiple magazines, much thanks to the “open profile” that I originally introduced. My friendship with Sam Nurmi resulted in an employment and partnershop in Loopia. From the beginning, I managed the technical operations, domain names and support. With time I also managed staff, development, administration, marketing and finally the whole company. Loopia was awarded “the best Swedish hosting company” in 2005, with praise for its marketing. The company was sold to Active 24 in 2005, who then was bought by Mamut (and later on Visma). Loopia is today the largest web hosting and domain name provider in Sweden. My first attempt at being self-employed ended rather badly. With a colleague from Makalös, I started a web design company where I managed tech and design, while my colleague was supposed to manage sales and economy. But my colleague misbehaved so gravely that the company went bankrupt, with large debts. My colleague “went under ground” so I took full responsibility and lived on noodles for some years. It was at Makalös that I started my career in web hosting and domain names. I single handedly managed all hosting customers (500+), while doing support, operations, development etc. These task were previously managed by three (3) consultants. At Makalös I met a guy named Sam Nurmi. When I finished school, I had some odd jobs as store sales, PC technician, data registration etc. Some of the high-lights from this time was my work at Gameshop and an internship at Dafix Data/Calypso Internetservice. I was the webmaster of Svenska Saabklubben (the Swedish Saab Club), the largest club in the world for Saab car enthusiasts. In my time as webmaster I centralized, simplified, automated and lowered the operations costs of the clubs IT services. Today, Saabklubben has one of the largest WordPress Multisite networks in Sweden with membership management, webshop, forum and much more. I was also on the board of Saabklubben in 2015-2017. I was on the board of Binero AB as a partner in the company. I was on the board of Registrars.se (industry association of .se TLD providers) between 2005 – 2009, being the chairman of the board for the last two years. Registrars.se work closely with IIS (who manage the .se TLD) and, among other things, suggested the new Registry-registrar model that was introduced in 2009. I was on the board of BRF Johanneshöjden in Västerås, when it became a tenant. My education is less relevant for my knowledge, experience and work. I didn’t have the best of grades, due to wrong high school/college orientation. The best things I learned in school was my greater knowledge of the Internet, which I explored myself back then. This became the foundation for my future career on the Internet. Can be supplied on request. A passionate web geek, who loves open source and a free & fast Internet.